every day to make more profit"
Price action chart patterns are less effective than the harmonic chart patterns. That is why, forex traders focus to learn the ways to draw the harmonic chart patterns and the ways to apply them in forex trading. 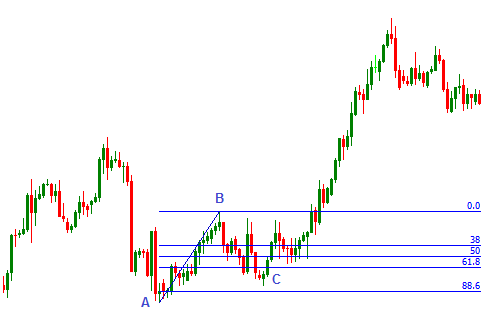 This is post is written to explain the way to draw a bearish crab harmonic chart pattern. This pattern is a XABCD pattern as in the image below. 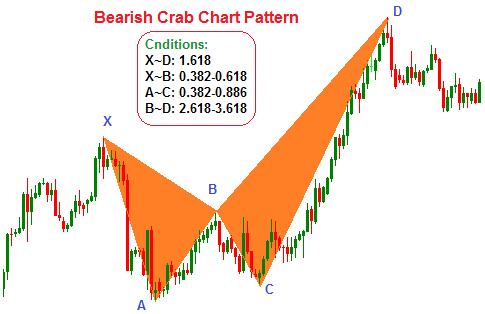 The first part of this post explains "How to draw a bearish crab harmonic chart pattern", and the second part explains "How to apply the bearish crab harmonic chart pattern in forex trading". Let's see how a bearish crab chart pattern can be drawn.To draw a bearish crab chart pattern, first we will find the X and A points on the price chart. X and A points is found on the top and bottom of a bearish trend respectively. 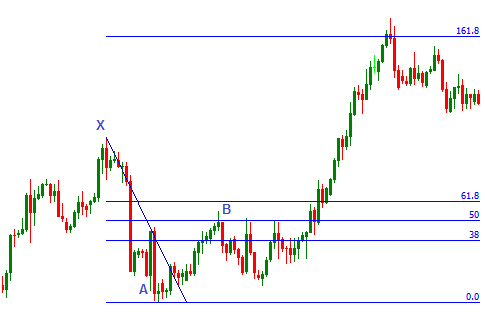 In the second step, draw a Fibonacci retracement tool from X to A to find the retracement level at point B, which should be 38.2-61.8 percent. It also means Fibonnaci ratio of X-B is 0.382-0.618, which confirms the point B. In the second step, draw a Fibonacci retracement tool from A to B to find the retracement level at point C, which should be 38.2-88.6 percent. It also means Fibonnaci ratio of A-C is 0.382-0.886, which confirms the point C.
In the second step, draw a Fibonacci retracement tool from B to C to find the retracement level at point D, which should be 261.8-361.8 percent. It also means Fibonnaci ratio of B-C is 2.618-3.618, which confirms the point D.
In the fifth step, the point D is reconfirmed by measuring the Fibonacci ratios of X-D. Here the D point is confirmed at 1.618 Fibonacci ratio of X-D. To find the ratio, a Fibonacci retracement is draw from X to A. 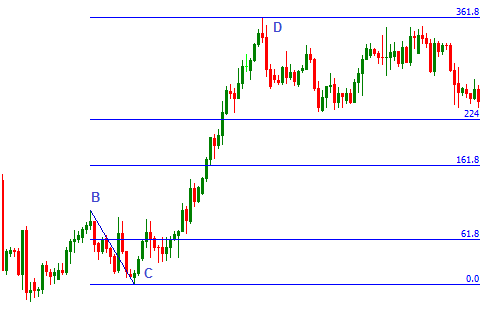 Draw a Fibonacci retracement tool from X to A to find the retracement level at point D, which should be 161.8 percent. It also means Fibonnaci ratio of B-C is 1.618, which confirms the point D.
In the final step, XA, XB, AB, BC, BD straight lines are drawn. 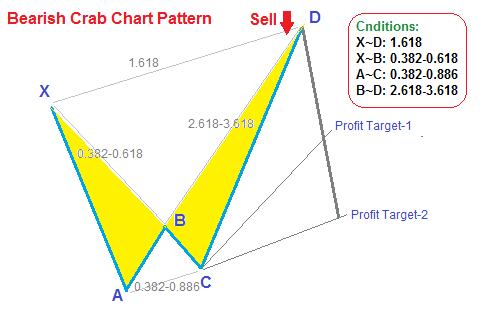 A sell order is placed upon the completion of the bearish crab harmonic chart pattern. But smart traders often love to place a long order at the point C. The profit target for the long order at point C is placed at the point D, and the profit target for the short order at point D is placed at the 61.8% or 50% retracement level of point C. Even the profit target for the short order at point D can wisely be placed on the AC trend line. If you have any questions, suggestions, or complements, please drop a comment below.